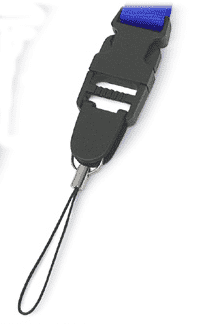 Carry your loupe or hand magnifier on a strong, comfortable nylon fabric lanyard. Length is adjustable to a maximum of 35 inches with lightweight buckles. Width is 5/8 inch. A universal cell phone style string holds your loupe. Attaches to a sturdy plastic breakaway for safety and convenience. Available in black, red and royal blue. The loupe lanyard is the most comfortable way to take your hand held magnifier with you.